We can’t promise to get to all these sessions and blog about them for you, but here are a few that caught our attention at the American Telemedicine Association Annual meeting coming up in Los Angeles next week. Telehealth is proven to decrease costs without sacrificing quality for many scenarios. An interesting mix of private and public sector initiatives across disciplines including pediatrics and psychiatry. We love outcomes, and this session also feature’s Seattle’s own Carena. Cute title, serious results with examples across pediatric care. One of the biggest issues facing our healthcare system so new models welcome! Readmissions and care transitions, so important. Mercy, a Catholic Health System from St. Louis, is a quiet leader in telehealth. Find out why they dedicated an entire new building to for their telehealth practice. Plus a case study from Cleveland Clinic. Whew, that’s a lot of great content. Heart failure is a patient group where readmissions can be prevented with better communications, which telemedicine and remote monitoring can provide. With large deductibles, patients are increasingly making decisions as consumers. Telemedicine helps scale specialists, especially from centers of excellence and to rural areas. Another great benefit of telemedicine is to empower community health workers through remote support from specialists. We had quite an amazing year at Wellpepper and are really looking forward to great things in 2015. We’re looking forward to more changes and disruption in mobile health and telehealth, as well as new business models, billing codes, and proof of the efficacy and effectiveness of mobile health. Not surprisingly given the hype around sensors in 2014, our post comparing how the two stacked up was our most popular blog post. We read somewhere that your favorite tweet is not destined to be your most popular. This blog post has a warm space in our heart as it was a surprise to see mobile health as mainstream as a heartwarming Disney film. Our conference recaps are always popular, and this one was especially popular as all healthcare professionals are champing at the bit for billing codes that reflect the innovative new ways they want to practice. Boeing is really pushing the payers and providers to deliver cost-effective outcome-driven care, so we are chuffed to see this one at the top of the list. Which other employers are going to take the mantle for 2015? This recap of a talk on social media and popularity as important to scientific research made our top 5, and while the advice was great, and the debate on popularity vs credibility is important, we suspect it may have something to do with the mention of the “K” word. “People will share about their diarrhea on Twitter but they won’t use an app called ‘Diarrhea Near Me” said John Brownstein, Director of the Computational Epidemiology Group at Children’s Hospital Boston and founder of HealthMap, on why patient reported outcomes alone won’t solve our data problems in healthcare. The third day of the M-Health conference coincided with the first day of the Global MHealth Forum, and the keynote presented the most aspirational view of the three conference keynotes. HealthMap, which was recently acquired by Booz Allen, focuses on mining public data to predict epidemics and to chart the course of infectious diseases. We’ve seen this before with Google Flu Trends, but HealthMap goes beyond what people are searching for crawls over 200,000 websites globally including social media networks, news, government sites. HealthMap uses natural language processing to take it a step further by comparing this data to satellite images to see whether quarantine is working. While HealthMap considers itself a public data set for health, Brownstein is clear that partnerships with private sector are the only way to scale health programs, and that these programs must have a business model. Texting for health scenarios that partner with carriers are a good match. The carriers are looking for new customers, and SMS programs have proven to be very effective in developing countries. In a twist on that model, Orange partnered on a program in Liberia where health workers got free data access to any government health information sites and then used their own data for Facebook and Twitter, capitalizing on human nature that while we might buy our devices for work we spend a lot of time goofing around on them. Too much data that we can’t make sense of. We haven’t previously been capable of tracking people’s vital signs 24/7 during daily life so it’s impossible to know what a “normal” data set looks like. The novelty of trackers wears off after you calibrate. We’ve written about this before. Once you know how many steps something is or how many calories you’re burning, you don’t need to keep wearing the tracker. Of course, there is also the often-cited issue of doctors not having the time, interest, or financial incentives to look at all this data. None of these are particularly new or daunting, which again points to the need for solid implementation and adoption evidence from m-health vendors. James Levine, Professor of Medicine at the Mayo Clinic, wanted more thought put into what data we use and why, and provide the example that many over the counter blood pressure readings are not valid. Levine would like mobile health applications evaluated by the following criteria. What is the medical benefit? Is it cost-effective? What is the return on investment? Is data interoperable? Is data protected? Can you analyze the data the application collects? Can you take action if you need to address something based on patient entered data? Is it constantly improving based on patient input? Teri Pipe, Dean of ASU College of Nursing, and as the moderator pointed out the only nurse on a panel at the conference, said that the promise of m-health is being able to know when to bring a patient into a clinic for treatment, and allowing them to stay at home when they want it. We would add to that, how do you help them manage when they are at home. She also felt that mobile health held great promise in the hands of nurses who can prevent ER visits from the field while being connected to the healthcare system via mobile. Teri used the example of fire departments having nurses on staff to treat minor trauma and injury onsite rather than sending people to the ER. This was our first MHealth Summit, although it was the 6th annual, so we can’t compare to previous years. It seems like the overall tone was of cautious optimism. Attendees, panelists, and presenters all firmly believed in the promise of mHealth but there was not enough demostratable evidence, and certainly not enough examples of health systems, payers, and m-health companies overcoming the barriers we have in the market. Hopefully, as the first day keynote asked, 2015 will be the breakout year for MHealth, and we’ll see more success stories, ROI, and clinical validation at the summit next year. Marcelo Calbucci (@calbucci) is Co-Founder and CTO of Everymove, a company that automatically integrates data from various fitness trackers and provides consumer rewards from its partners. Julie Kientz (@juliekientz) is the director of the Computing for Healthy Living and Learning Lab (CHiLL), a group of UW researchers interested in designing, developing, and evaluating apps that aim to promote healthy lifestyles and education. Rebecca Norlander (@rebatwork) is the Co-Founder and CEO of Health123, a consumer health company that helps people make decisions and track the small changes in their lives that can make a big difference in their health. The three speakers shared a passion for designing person friendly applications for consumers to manage and improve their health. The three talks provided different perspectives on the topics of how to engage users and overcome their barriers or burdens to both application use and improving their health. Trying to be all things to all people. This was a criticism of apps that try to track too many things. Figure out what behavior you’re trying to affect and do a great job of that. Putting the organization rather than the person at the center. This would be designing for the healthcare organization rather than the patient or worse yet for the insurance company rather than the patient. Misaligned or misguided incentives. Marcelo used the example of paying people to track something for example finding out their BMI rather than trying to incent them to change something, like become more active (and then lose weight). Historically there has been an idea in the health and wellness area that if you have information you will change. Information is really only one component (as Julie elaborated on in her session). Health Risk Assessments. Marcelo thought that these were particularly dangerous as people tend to associate these types of assessments with tests and then inflate their answers and then assume they are healthier than they thought. Bad UX and bad visual design. 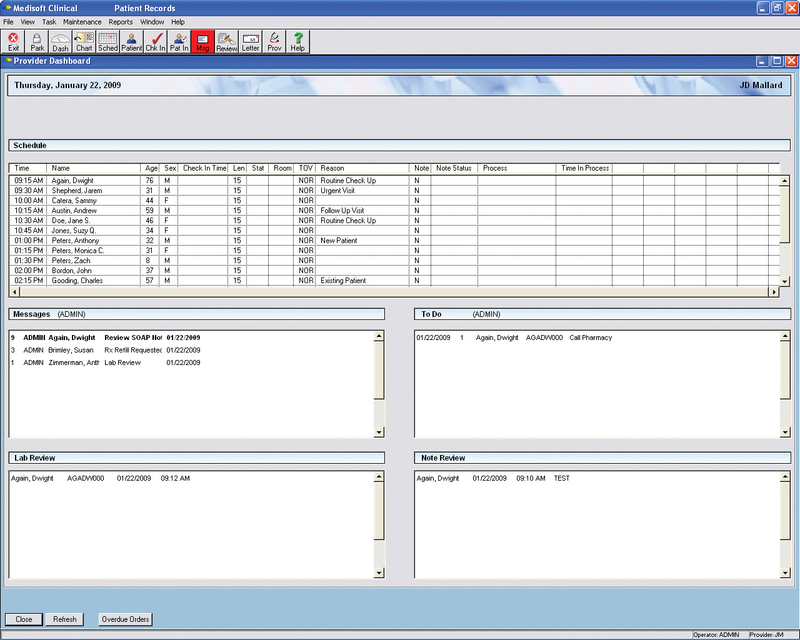 Marcelo showed an EMR screenshot saying “the 90s called, they want their interface back”. Treating a person as a condition. The person’s condition is not who they are and is only one component of the information a healthcare provider or application needs to understand to care for or help support that person. Making you change to fit the application or service. Wearables still fall into this category. You need to remember them, you need to wear them, and in the case of the new FitBit force, you need to get medical attention after wearing them. Julie Kientz was up next, and her human-centered design approach provided practical advice to solve many of the pet peeves that Marcelo mentioned. The goal of Julie’s research is to understand and reduce the burdens in healthcare design. She described 8 key burdens that can impact adoption of healthcare technology. Physical: Is the technology comfortable to use or to wear? Does it fit in with my surroundings or what I am doing? With wearables, physical is obvious, but physical could also be how you access the application, for example which tasks are better for a mobile device versus a PC? Mental: How do you feel about the technology? Julie said she feels sad when she forgets to put her FitBit on, and often goes back home to get it. As well, she is on her 6th FitBit in 3.5 years due to losing them, so is also feeling some guilt about the loss. Access: Is the technology designed for diversity? For example, many nutrition trackers do not include foods that are popular with different ethnic groups. Time: How much effort is required to enter or review data? Julie personally doesn’t look at her FitBit data online, just at the step count on the display. The online reporting is too much effort for her. Emotional: What is the emotional impact of not meeting the goals the technology is tracking? Do you feel like a failure? Financial: How much does it cost? Does it require expensive equipment like a smartphone? Are there added costs like a data plan? Social: Does others use of tracking make you feel better or worse? Do you feel guilty when someone posts their runs online? Because these burdens compete with each other it’s impossible to design to eliminate all of them at once, and so you have to understand which are the most important or provide the biggest barriers for the audience you’re designing for. Julie and her lab published a paper on this if you want to know more “Understanding the emotional burden of health technologies”. She also provided some practical examples of how her team has developed technologies and studies to accommodate these burdens. One example is the ShutEye sleep tracker that’s designed for people who have some trouble sleeping but are not motivated enough to seek professional help. ShutEye is an Android app that displays on the homescreen with recommendations based on the time of day. For example, it will tell you whether it is too late to have caffeine if you want to get a good night’s sleep. Another application, BabySteps deals with the emotional component of child development, by displaying development stages as trees in different stages of growth. This removes the stigma of clinical terms like delayed. BabySteps is designed to be used over the first 5 years of a child’s life so the team is also experimenting with different interactions to keep parents engaged for example, a Twitter feed that asks questions about child development. You can find links to all of Julie’s research here. Knowledge: Once you have awareness, what can you actually do? Health information is often not delivered in a way that is actionable. Self-efficacy: People cannot make big changes all at once. How do you make small and incremental changes towards health? Personalized Solutions: Generic solutions don’t speak to the person or help them take personal responsibility for their health. Personalized solutions are customized based on information about that patient and provide options appropriate for that person’s health. Time: Solutions need to integrate with people’s lives. Behavior change cannot take so much time as to be prohibitive. What small steps can be integrated? Support: What types of social support does a person need to make a change? For example, there are many great fitness and health communities, like Strava for cyclists, where people support each other’s goals. On the other hand, social support needs to be in the control of the person. Applications shouldn’t be posting updates on the person’s behalf. Rebecca walked through all of the above in the context of a Health 123 demo that showed how they simply address the issues. For example, awareness takes the form of a series of simple health questions. Knowledge is tailored health information based on the questions the patients answered. Self-efficacy is addressed by making health challenges reasonable to fit into a person’s day and week. If you’re interested in or working in health technology in Seattle, I highly recommend these meetups. The content and discussions are packed with inspiration and information, and the burgeoning Seattle Health IT community needs your support. You can find out about the next meetup here. Infographic: Is mhealth poised to explode? Floatlearning.com takes a look at how mobile phones and mobile devices are changing health care.